It is so good for a light cleaning on my wood floors. Picks up crumbs and cat hair very well. Vacume cleaner is too heavy since I have diminished health. The carpet sweeper is great, picks up crumbs without a struggle. It means I don't have to get out the vacumn. It's great for my cat's hair and my crumbs. i love it at this time of the year.it clears nice . I OWN A LOUNGE AND WE GIVE FREE POPCORN WHICH IS MESSY AND THIS DOES THE JOB WE WERE LOOKING FOR. THE PRICE WAS GREAT AND IT WORKS WONDERFUL. I had a toy bissell 60 years ago that my Mother used then, and I did too until it died years later. I was so happy to get another one that is just a bigger version of my toy and it works just as good...I'm buying ones for my daughters who complain about dragging the vacuum cleaner out...this is quick and convenient and works great...BUY! Love it!! Even my husband even volunteer to even vacuum. Just to use the carpet sweeper. It does the job fast and it does not take much space to store it. 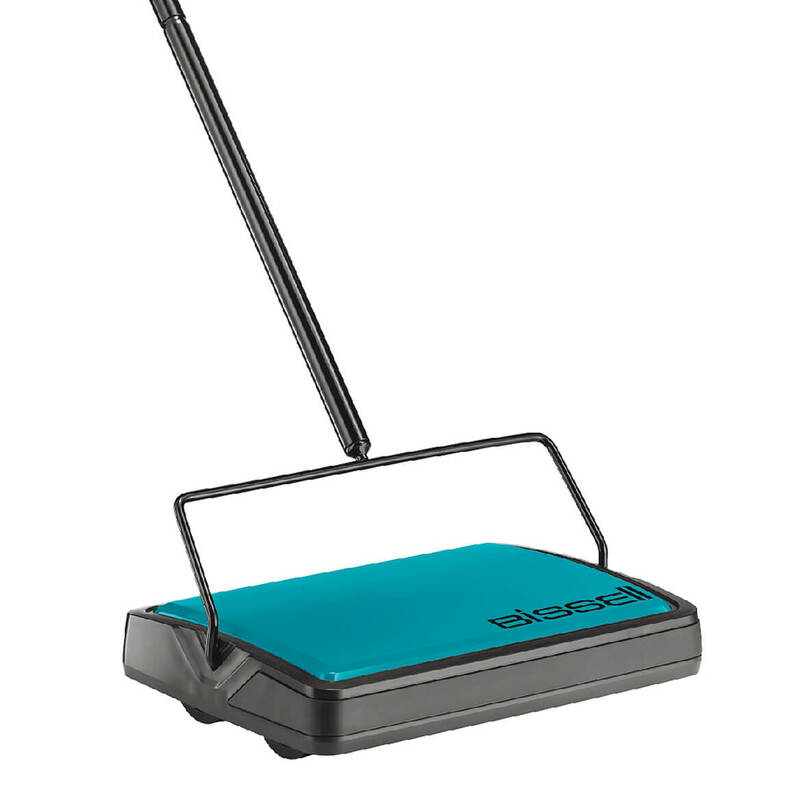 The perfect sweeper for last minute vacuuming. Can't live without it. A must have. This thing is awesome! We have cats (rescued and fostered) and I use it daily to keep up with the fuzz so i don't have to drag the vac out but once a week! And it DOES work...I was sooo pleased to see how much it got up! Great product! Use it daily for quick pick ups to tidy the house. So easy to put together & store. perfect for quick cleanup and reasonable price. The Bissel sweeper keeps me from pulling out the large vaccum every day. I babysit my toddling granddaughter and this helps enormously with her not picking up "things" and putting them in her mouth. I am on my second one-love it. I have just bought my second Bissel carpet cleaner. Love it for quick jobs. Saves on "dragging" the big vacuum out. I like it because there are no wires to drag around. I just get it - sweep - empty - put up. Excellent! I have wasted money on those small electric battery charged sweepers. They work good for a few sweep ups then the filters need to be cleaned. The bissell is easy to use and to clean without all the extra parts. This is also very light to carry up and down the steps. I have also used it to sweep up the outdoor carpet. It is great for picking up dog and car hair. Love it! Do recommend an original vacuum cleaner to sweep steps and for a deep good cleaning. Actually this is the 2nd one I bought....so I must like it, huh? Well was so impressed with the 1st one that I bought this one to keep in my sewing room. It's lightweight, quiet....and when I empty it, I'm amazed at how much it picked up. It's great for cleaning up that kitty litter that gets scattered around the litter box and even picks up cat hair. It works well on my low pile carpet and on the vinyl flooring in the rest of the house...and the handle drops so low that you can clean under everything. The only downside is that the brushes need to be cleaned when I empty it but that's just a testament to how much it picks up! The sweeper is light and easy to use. It will not replace your vacuum cleaner but it is handy to pick up bits of litter so you don't have to lug out the vacuum as often. I have a low pile carpet and don't know how well it would work on deep pile. I have a carpet that shows footprints and the Bissell Carpet Cleaner removed lint, threads, etc. and brushed over the footprints leaving no trace of them. I use this for any messages especially cat hair! It is excellent for cleaning any non liquid messes. It is quick and easy to empty. Best on low-pile carpets or bare floors. Good for a quick pick up. I have 2 bad shoulders. I use this with no problems. I have berber carpet. It is light weight and small. We have 2 dogs and this works for quick clean-ups. I'm not sure how it would work on a deeper pile carpet, but we have rugs and wood floors so it's handy for me. I just wish the handle were longer! Works better than vacuum cleaners. I mainly use it to clean carpets, this takes the hair and lint off better than vacuum cleaners. this sweeper is great for quick cleanups. i had one that belonged to my mom from many years ago and the handle broke. i was happy to see it in your catalog so i ordered it. my 4 year old granddaughter loves to use it to help me clean. The old things still work! This sweeper is great for quick jobs when I don't want to drag out the big vacuum cleaner. It does what we expected it to do. Light cleaning of rugs inbetween vacumning. I would buy this all over again. Great for the daily clean up of dog hair. Removes hair from both rugs and hard wood. I use this sweeper for light clean-up jobs. This is my 2nd sweeper. Yes, I would buy again. Rather than get the big vacuum out, I use this sweeper as a quick solution. As long as the brushes are cleaned regularly and the dust pan emptied, I hope it last 7 years as my first Bissell Sweeper did. A very good product, priced nicely. Well worth the money I spent for it. Just one thing I dont like about it. you have to clean the brushes after every use. This is my third Bissell Carpet cleaner and was delighted to find it in the Miles Kimball catalog. 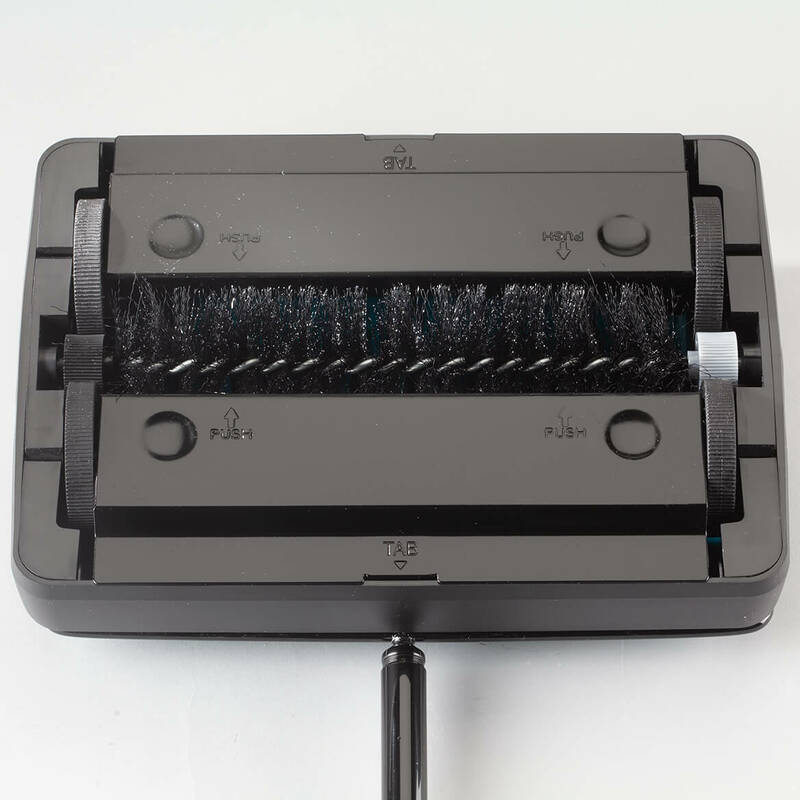 It can be used daily for quickly picking up crumbs and tracked in dirt from outside and, although it is a "carpet sweeper," it also works on floors without carpet. I especially like the fact that the handle lies flat and I can use it on a weekly basis under beds and other furniture where an upright will not fit. It takes up very little space, is easy to use and easy to empty/clean and it is so much easier than dragging out the vacuum cleaner every time there is a mess to pick up. Good for picking up cat hair on carpet. Not good on floors other than carpeted. this is a great cleaner. I love it for pet hair pick up. I have looked for several years for an old fashioned "non electric" carpet sweeper. Was so happy to find this one. It is great for picking up lint, grass and leaves that are tracked in. Great for "between" cleanings when I don't want the hassle of a heavy electric vacuum. Priced right. Use it for cleaning up all of the kitty fur on the carpet and other things, as well!!! Yes, I would buy it again!! 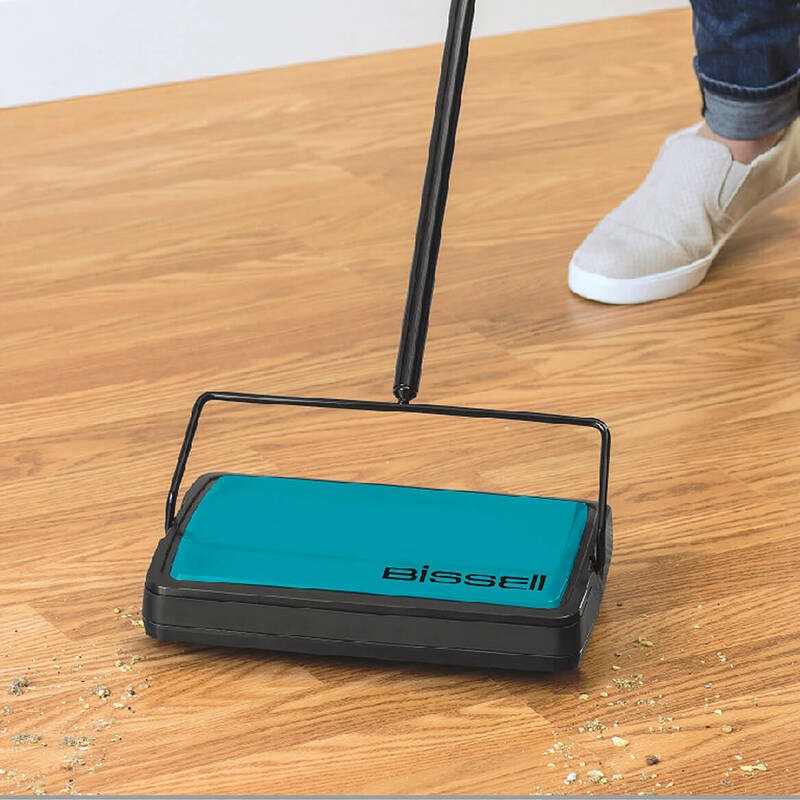 I love this Bissell sweeper. It is so convienent to just quickly sweep up little messes. It saves me time. A big plus is that I don't have to drag out my vaccumn every time. I use this product to clean my carpet and hard floors during late evenings because it's quiet so I don't wake my neighbors. Its fast and easy to use. But a person should use a regular vacuum periodically to pick up the dust that it can't pickup. Overall I'm very pleased with this purchase. Perfect for a quick clean-up under the kitchen table, everyday! Small enough to leave out, standing in the corner, ready to grab it when we spill crumbs. Mostly I use this sweeper to pick up lint and dog hairs from area rugs between vacuuming. It picks up very well and is so handy. Used for small jobs and quick clean-up of crumbs, lint on carpet, small dirt/leaves tracked in from outside but difficult to use on high level carpeting. I've owned similar type products in the past, but this one is almost impossible for me to use because when I push it over the carpet, it drags a lot and takes a lot more effort than the other brands I've owned in the past, so I probably will return it and/or ask for a refund. Doesn't transition well on carpet- VERY HARD to use on carpet- I have to push hard to get sweeper to move on carpet-worse than my Kirby. Unless you have real strong wrists- it's not worth it. It "grabs", and does not run smoothly on carpet. Middle roller fell out on first use. Unable to get it back in the unit. Not the quality I remember from years ago. I tried battery ones and it never keep its charge so I decided to go back to the old reliable that we has as a child and needed a quick pick up. I live a lone and don't need to use my regular vacuum that often, I think this will be perfect for in between cleanings. Had one and I loved it. I have two of these sweepers and love them. I ordered this one for my granddaughter. need one as a back up when the vacuum is not working. To do quick cleanups between vacuum use. I purchased this item for small job. I wanted a quiet way to clean the carpets. Works great! I wanted a vacuum/sweeper for my office that could be used at any time of the day. Bissell is a good brand and this is a reasonable price. I have been wanting a carpet sweeper for a long time, and now that it is on sale I couldn't pass it up this time. I've always wanted one, and now I've found it on sale....thanks! I love this sweeper. I am replacing a previous one. When a vacuum is not needed a sweeper is just the ticket. My grandmother had one of these it works just as good as a vacuum with a motor actually better! I liked the one I used to have, so I thought I'd get another. Need for picking up cat litter. I am a senior citizen and this will be easier for me to use than a big vacuum cleaner. Needed to replace the one I left behind. Always did the job for me. I had one before but the brushes are wore out, really like using this when a vacuum cleaner is to much. Bought one for Lake Cabin and it works so well picking up dog hair and is so quick and easy to use I now bought one for home too! For quick cleaning of the carpet and flooring..love it a great buy! my mom had one and I liked it. I have had this many years ago and it was wonderful. Now buying for my family. Spot sweep carpet in the cat room. Replace one I used to have. I have several of these and they do a great job for in between vacuuming. They pick up very well. BEST ANSWER: I like mine as well. It is great for the small jobs, when I don’t nessesarily need to haul out my vacuum. where do I find replacement brushes? BEST ANSWER: Thank you for your question. Unfortunately we do not know where you can purchase the replacement heads. We hope this information will be of help to you. Telescopic triangle mop Not a vaccum... It is small enough to dust the floor in small areas. I purchased one from you 12-2-14 ...Item no. then 349801? BEST ANSWER: Thank you for your question. The carpet sweeper is best used on carpeting. We hope this information will be of help to you. where can i get the comb to clean the brushes on the sweeper ? BEST ANSWER: Thank you for your question. Unfortunately, we do not sell the comb. We hope this information will be of help to you. Saw this in my Mother-in-laws book for 24.88 as a Gr8deal can I get it for that?